The OVE Torrance 4-piece sectional set is highly versatile and can easily be re-arranged to accommodate virtually any space. Ideal for backyards, pool sides, or patios. It features two ottomans and 2 loveseats which provide endless possibilities. Whether you feel like having a nap, sitting down with friends or lying under the sun, the OVE Torrance will make your summer days seem even longer. Tap into the magic of summer with the ALLiBERT California Loveseat with cushions. The rounded resin wicker couch is comfortable, stylish, and functional for relaxing around the pool, on the deck, in the sunroom, or on the dock this summer. Manufactured in the Netherlands, ALLiBERT designs easy-going furniture for easy-going people. The attractive 6mm round wicker California 2-Seater Loveseat has a luxurious look and feel. The resin is charcoal in colour with cool grey cushions, and the loveseat is easily assembled without tools. It can be combined with additional ALLiBERT furniture (California 3-Seater Couch, California Table, and California Arm Chair) to make for a beautiful outdoor oasis. Relaxing moments in your backyard are made easy with the addition of this patio swing. The sturdy, accented steel frame is complimented by an arched shade canopy, and removable 4 inch tufted seat cushion with a comfortable foam topped backrest. Made from durable, UV resistant Olefin fabric, this shade-creating canopy and seat cushion are made to withstand the test of time. Gently sway your afternoon away! Only simple assembly needed upon delivery means you can complete your patio in minutes. Add style to your outdoor space with the Pacific Landing pergola swing. This swing feature a weather-resistant retractable canopy to allow you to choose between sun and shade. The cushioned swing is held in place by study, decorative ropes. This swing includes a seat cushion, back pillows, 2 bolster pillows and 4 decorative accent pillows. The perfect accessory for your Echo Garden bench is a cushion specifically made for it. This beautiful cushion is made from Sunbrella, the number one fabric for outdoor use. Sunbrella resists fading, and will not support mildew growth. Spot cleaning is easy with mild soap and water solution. For complete care and cleaning .You can choose from either macaw or pacific blue. Either one will freshen your outdoors! 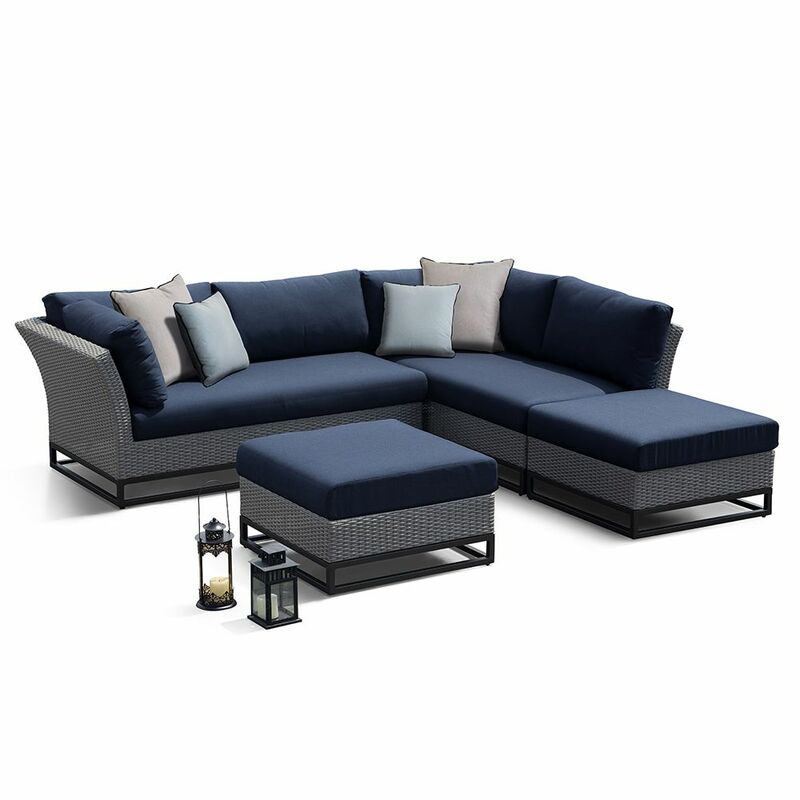 Torrance 4-Piece Sectional Set Dark Blue The OVE Torrance 4-piece sectional set is highly versatile and can easily be re-arranged to accommodate virtually any space. Ideal for backyards, pool sides, or patios. It features two ottomans and 2 loveseats which provide endless possibilities. Whether you feel like having a nap, sitting down with friends or lying under the sun, the OVE Torrance will make your summer days seem even longer.